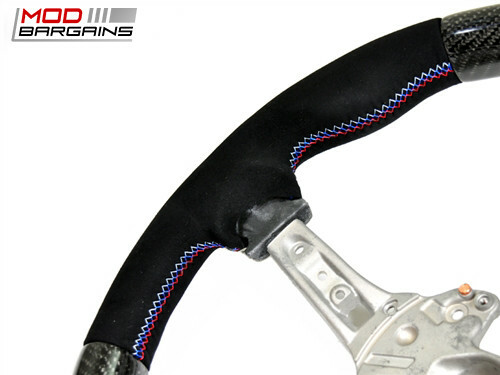 Your steering wheel is your main connection with your car, make it as comfortable and stylish as possible with this Leather/Alcantara wrapped Carbon Steering Wheel. 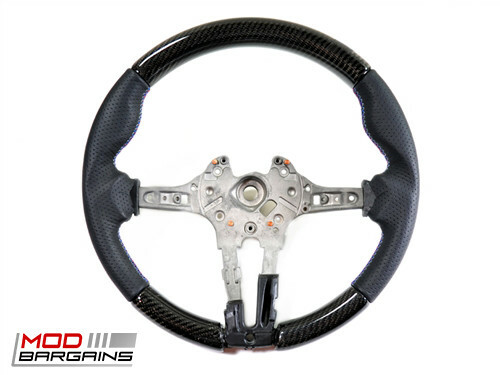 Spice up your interior with a sleek new Carbon Fiber steering wheel. This wheel makes a great addition to your interior to add an extra performance feel to your BMW. If you already have some Carbon Fiber interior trim pieces the the steering wheel works to compliment them. If you don't, it makes a great centerpiece that looks and feels impressive. You get the option of either an Alcantara material for the sides or you can opt for Perforated Leather if you prefer the feel of it. The wheel itself is made from a mold taken of the OEM BMW steering wheel so the fitment will be identical to the OEM piece and will not require any modification. Because installation involves unplugging the air bag of your vehicle we do recommend hiring a professional for safety reasons.